Linda Shenton Matchett: Mystery Monday: Who was Jean Anouilh? Resistance in general comes in many forms, and certainly did so during World War II. Activities ranged from sabotage and violence to clandestine publications and coded radio programs. But not all resistance was performed by members of any sort of organization. Such was the case of Jean Anouilh (pronounced ah-noo-eej). A playwright born in 1910 in a tiny village on the outskirts of Bordeaux, he seems to have received creativity from his mother who played violin. The family eventually moved to Paris where Jean attended Lycée Chaptal, a secondary school that taught students trades. He went to law school, but was unable to afford tuition and left after eighteen months. There followed a variety of jobs from copywriter at an advertising agency to secretary a French theatre director, Louis Jouvet. It is unclear whether he was always interested in playwriting or the desire was sparked by his work with Jouvet. Jean managed to get two of his plays into production, but they closed after just a few performances. Undeterred, he continued to write and finally found success in 1937 with Le Voyageur sans Baggage (Traveler without Luggage). After that, every theatre season featured one of his works. Vocally apolitical, Jean continued to live and work in Paris during the German occupation. However, because he refused to take sides, had several public disagreements with Charles de Gaulle, and was one of many who signed a petition to prevent the execution of writer Robert Brasillach, some feel (then and now) that he was a Nazi sympathizer. 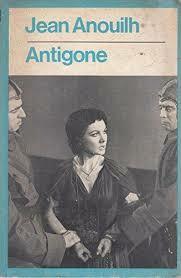 Completed in 1942, Anouilh’s adaptation of Sophocles’ Greek tragedy Antigone (pronounced Ant-ee-gōn to differentiate it from the original An-tig-on-ee), became a symbol for the underground. As one scholar put it “freedom fighters saw the heroine’s defiance as a rebel-yell to patriotism.” Others have commented that the play is purposely ambiguous about the rejection of authority by Antigone and the acceptance of it by Creon. Another claims Jean purposely adapted the play to speak out against authoritarian rule. Whatever the truth about its inception, the Nazis saw nothing wrong with it, and while German censors regularly suppressed any new works that even hinted of anti-Fascism, Jean’s Antione slipped past as a safe retelling of this classic tale that debuted in 1944. Five years later, it premiered at the Old Vic Theatre in London and starred Laurence Olivier and Vivien Leigh.